An interim report on the search for Iraqi weapons is due soon, but there are indications the reports findings might be inconclusive. The Times of London reported this weekend that the report had been postponed because of lack of evidence. But CBS News has learned there is no delay. The Times reports the decision by Britain and America to delay the report's release comes after efforts by the Iraq Survey Group, a team of 1,400 scientists, military and intelligence experts, to search Iraq for the past four months to uncover evidence of chemical or biological weapons ended in failure. In July, David Kay, the survey group's leader, suggested that he had seen enough evidence to convince himself that Saddam Hussein had had a program to produce weapons of mass destruction. He expected to find "strong" evidence of missile delivery systems and "probably" evidence of biological weapons. But last week, Defense Secretary Donald Rumsfeld said he had met with Kay, and that the onetime weapons inspector had not informed him of any finds. 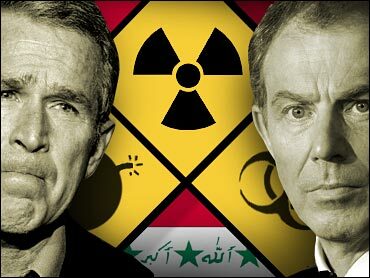 The United States and Britain invaded Iraq because they believed Saddam's regime was developing nuclear arms as well as chemical and biological weapons. So far, no weapons of mass destruction have turned up in Iraq, nor has any solid new evidence for them been reported by Washington or London. Last week, in a confidential report obtained by The Associated Press, the International Atomic Energy Agency chief said U.N. inspectors found Iraq's nuclear program in disarray and unlikely to be able to support an active effort to build weapons. Mohammed ElBaradei reiterated that his experts uncovered no signs of a nuclear weapons program before they withdrew from Iraq just before the war began in March. "In the areas of uranium acquisition, concentration and centrifuge enrichment, extensive field investigation and document analysis revealed no evidence that Iraq had resumed such activities," ElBaradei said in the report, made available to the AP by a diplomat. "No indication of post-1991 weaponization activities was uncovered in Iraq," he said. Former weapons inspectors now say, five months after the U.S. invasion, that what the U.S. alleged were "unaccountable" stockpiles may have been no more than paperwork glitches left behind when Iraq destroyed banned chemical and biological weapons years ago.